Beautiful Bella was seen last month as an emergency out of hours at our Warwick hospital. She had been out in the garden and had come back retching and seemed very uncomfortable. Night vet Roxanne was worried Bella had something stuck in her nose or throat which was causing her symptoms, so she was admitted for an anaesthetic so we could have a good look at the back of her throat. 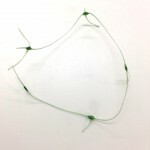 It soon became clear why Bella was gagging- she had 2 long blades of grass stuck at the back of her mouth behind her soft palate. 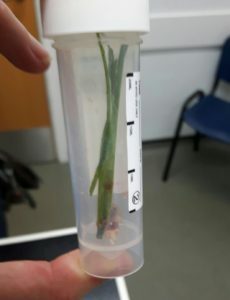 Bella was given an antibiotic and an anti-inflammatory injection to resolve the swelling and infection caused by the grass blades. By the next morning Bella was a lot happier and she is now back to going out in the garden to hunt- hopefully she won’t catch any more grass blades! This is Eric, a tiny 1year old Yorkshire Terrier. 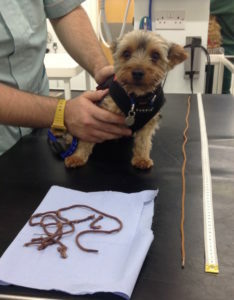 Yesterday he stole a shoe and after chewing it to pieces he managed to eat the shoelace – all 107 cm of it! 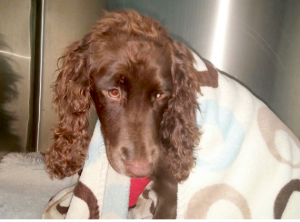 His owners realised what had happened and brought him straight to our Warwick hospital. Vet Helen advised to make him vomit whilst the lace was still in his stomach, as once it starts to pass through it could easily have caused a blockage in his intestine. 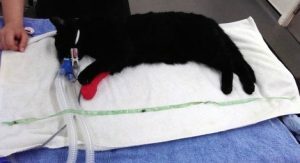 After the injection to make him sick Eric brought up the entire shoelace, and his owner had helpfully brought the other shoelace for comparison! 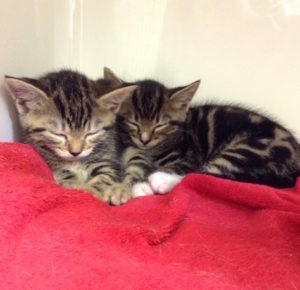 These two gorgeous kittens are only six weeks old but have already used one of their nine lives. Their owners hadn’t realised they were happily curled up asleep amongst the dirty washing in the laundry basket and accidentally put the kittens in the washing machine. 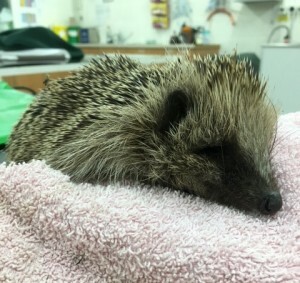 The owner acted quickly as soon as they realised what had happened and got them out, dried them off and brought them straight in to us to be checked over by Warwick vet Gemma. They were alert and conscious but cold and in shock. 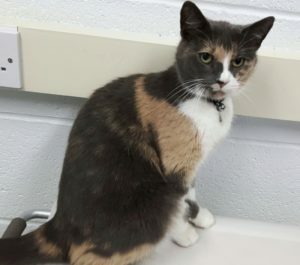 Gemma was worried they may have inhaled some water and detergent which could cause delayed breathing problems so they stayed overnight for observation. By the next morning they had recovered really well and their breathing was completely normal so they were able to go home that day. 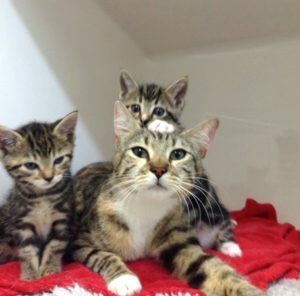 Here they are with mum Peach after their ordeal- already feeling better and back to their mischievous ways! 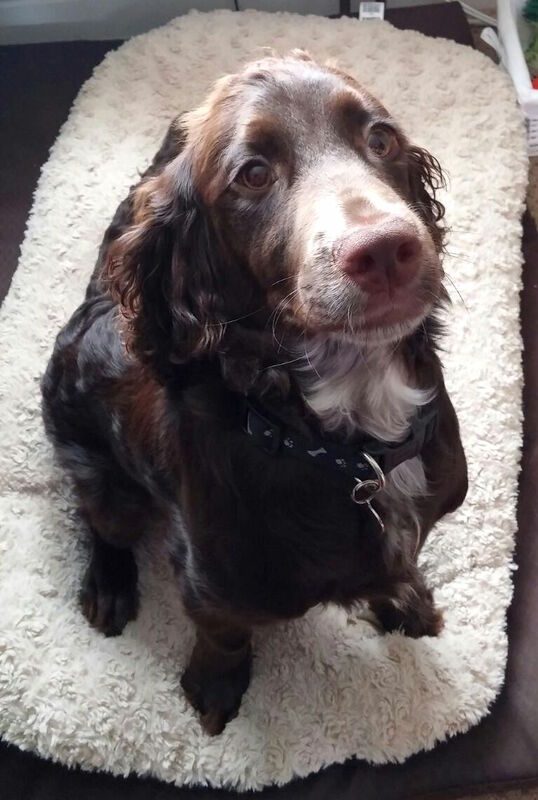 Their owners would like us to share their story and advise all pet owners to check laundry baskets before loading washing machines and tumble dryers. These lovely kittens were very lucky and have made a full recovery, but it could easily have been a different story. Avonvale Vets all said a fond farewell to Anita on Friday as she hung up her stethoscope after 30 years of dedicated service. Staff at Warwick held an impromptu tea party for her, resulting in a table groaning under the weight of home-made cakes – a reminder of what she would be missing! 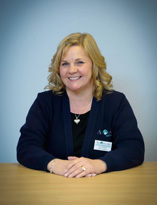 Anita started Avonvale’s first surgery in Warwick on Cape Road over 30 years ago and has seen the practice go from strength to strength over the years. Despite being a small animal practice, Anita’s qualifications and experience in Sheep and Goat medicine also led to a steady procession of our cloven hoofed friends turning up at the main hospital with various ailments or for more routine care such as disbudding. 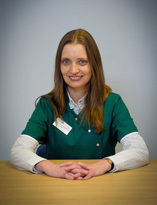 Anita has always treated both her clients, patients, and everybody at Avonvale as part of her extended family. She’ll now have more time to spend with the real thing! 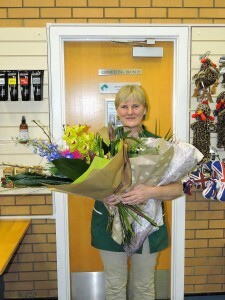 Please join all the staff at Avonvale in wishing Anita a very long and happy retirement. There have been some exciting changes across Avonvale recently. 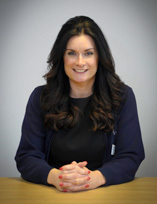 This month we have bid a very fond farewell to Diane, our Practice Manager who has worked for Avonvale for over 12 years. We wish her all the best in her new adventures in sunny Abu Dhabi! We are very pleased to welcome new Practice Manager Kate Webb and administration assistant Ann to the Avonvale team. 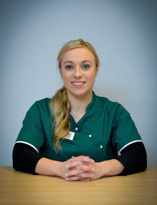 Our Stratford branch going from strength to strength means we have recruited three new vets! Welcome to Lara, Gemma and Daisy. Daisy will be joining our Stratford team while Katie is on maternity leave, Gemma will be mostly at Warwick and Lara will be working across all of our surgeries. 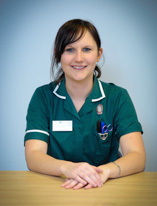 We also welcome our new nurse Denni, who many clients at our Stratford surgery may have met already. All our new team members are looking forward to meeting our clients and their pets over the next few weeks. Congratulations Emily! 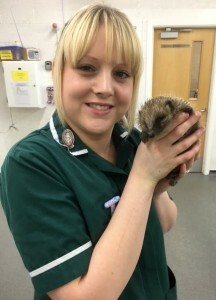 She has worked as one of our animal care assistants at the Warwick hospital for the last year but now she is leaving to go to Nottingham Veterinary School. Getting into vet school and vet nursing courses can be very competitive. For both you need lots of work experience. We often have school and university students coming into our practices to see how it all works but these places get booked up fast. If you are interested in seeing practice with us please let us know the dates you could do and send them with a CV and covering letter to the head nurse at the surgery you would like to go to. Avonvale pets are assured of the most up to date diagnostic blood tests with the recent upgrading of our blood testing equipment. This offers a wider range of tests and faster results in-house. Blood tests are a vital tool to accurately diagnose illness in our pets. Blood samples can be specifically profiled to examine the function of the liver and kidneys and assess glucose levels which can indicate illness at its earliest stages. 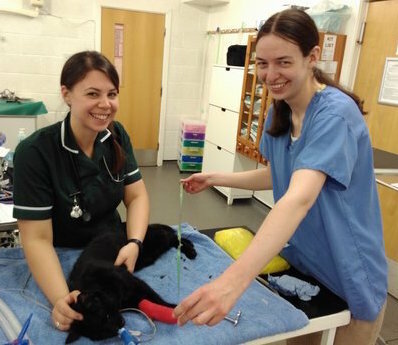 Blood tests are often run in preparation for a general anaesthetic to ensure precise medication and monitoring and to allow us to make the aneasthetic as safe as possible for your pet. The specific slides used for the test can be expensive. We know that this level of diagnostic testing is not available to all animals and have donated our left over slides from the previous analyser to the PDSA in Coventry to help other pets. The Peoples Dispensary for Sick Animals is a national charity who provide veterinary care for pets where owners are in difficult financial circumstances. 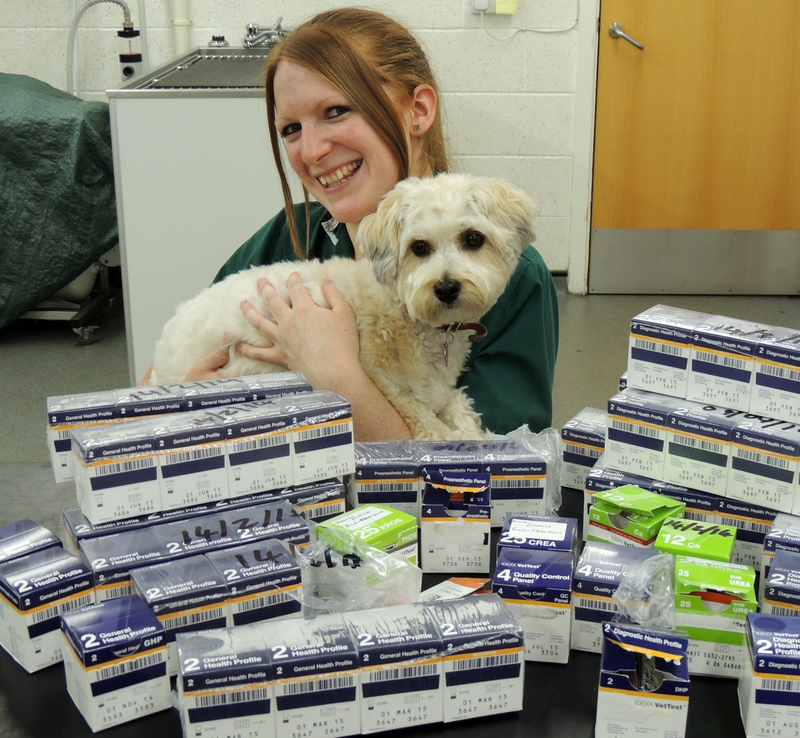 The test slides donated free of charge will allow the PDSA to run 148 blood tests for sick pets in situations where otherwise owners would not have been able to access them due to the cost.